This recipe is not for the faint of heart (or criticizer of food dye) – but if you’re all about having a bit of fun with your food, this Rainbow Grilled Cheese is just for you! 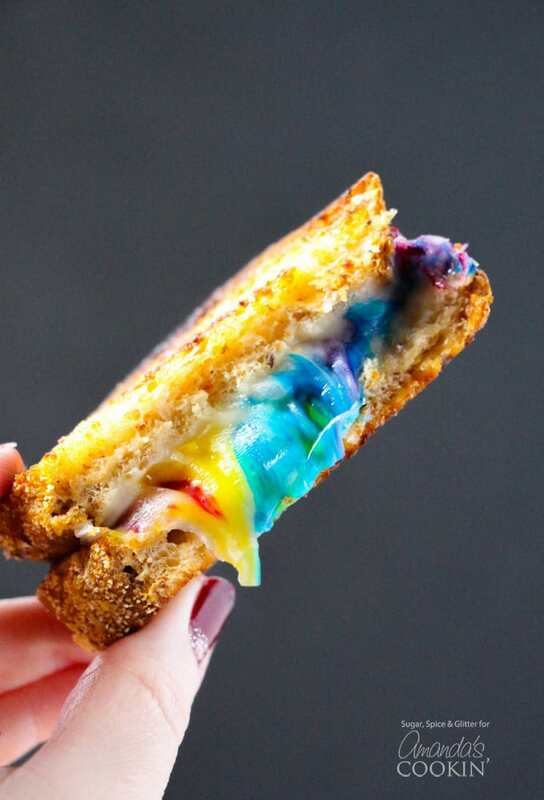 Why turn your grilled cheese lunch into a rainbow? For the unicorn lover in your family, or for celebrating St. Patrick’s Day or spring, of course! Last year, I was really committed to making all of our rainbow recipes healthy – from rainbow smoothies to rainbow spaghetti and fresh rainbow salsa – but this year, I’m indulging a little bit and having a bit more fun with our rainbow recipes. I still feel like this rainbow grilled cheese recipe was mostly healthy, using good quality cheese and whole grain bread, but yes – that cheese was rainbow colored. My kids went crazy for this grilled cheese, and while it’s not about to be a staple in our house, it’s definitely a fun lunch option that makes a rainy day just a little bit more special. You can alternatively add one single color for a birthday, team colors for a game day, or a mix of princess colors – whatever suits the occasion! Optional: top with colorful sprinkles to make Unicorn Grilled Cheese! You’ll also love these Rainbow Deviled Eggs and these Rainbow Cookies on a Stick! One thing that was really fun was not cutting through the cheese fully and encouraging the kids to pull their sandwiches apart to reveal the fun colors inside – all of the kids who didn’t help me make the sandwiches were so shocked and delighted at the rainbow colors (and my little helper was super proud of her handiwork). 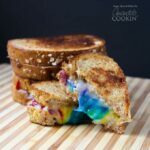 These rainbow grilled cheese sandwiches were such a hit with my kids and were actually pretty delicious to boot, making it a fun meal for the whole family. Would your family love this Festive Grilled Cheese too? A fun mix of green and red for a festively colored grilled cheese sandwich! Or maybe your kids would prefer this Bear Toast, inspired by Paddington bear, we give you 3 different options on fun ways to make bear toast! What do you think? 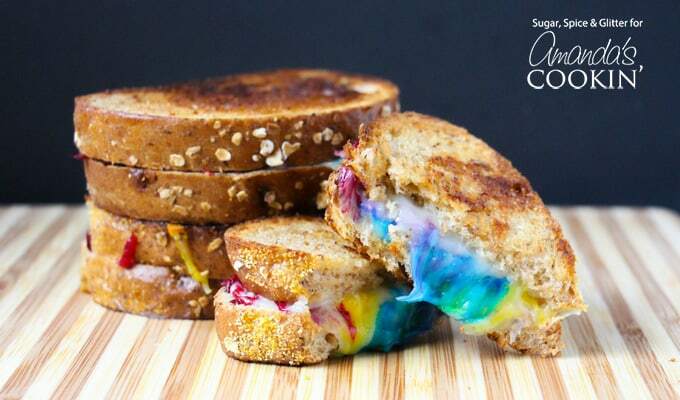 Do you have someone in your life that would go crazy for these Rainbow Grilled Cheeses? Who says you shouldn't play with your food? Make some fun food this St. Patrick's Day with this rainbow grilled cheese! Perfect for unicorn lovers too! 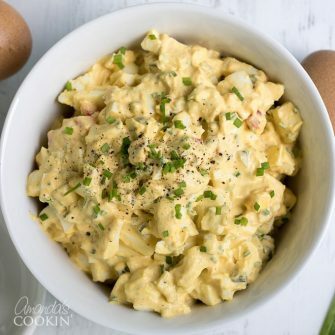 Divide the shredded cheese into four bowls and add a couple drops of food coloring: yellow to one, red to one, blue to another, and red and blue to make purple in the 4th. Stir the food dye into the cheese. Optional: top with colorful sprinkles to make Unicorn Grilled Cheese! This post was originally published on this blog on Dec 28, 2016. I just opened a wood fired pizza truck and want to offer ‘Unicorn’ pizza to the kids at a Halloween event in which we will be vending. I see your recipe above for rainbow grilled cheese. Can you give me feedback on the food coloring of the shredded mozzarella you dyed? Is the moisture content stable? Can you give me any advice? Hi Michelle. Unicorn pizza sounds so fun! I’m afraid I can’t answer that question for you. I think your best bet is just to experiment before Halloween and see how it turns out. I would love to know how it goes!